Steam, coal and iron, keystones of the industrial revolution, combine at Crumlin, near Ebbw Vale, in the mid-1950s. A timeless scene for which time had nearly run out. Steaming gently over the skeletal magnificence of Crumlin Viaduct - at 200 feet the highest on BR - a Pontypool Road to Neath train is smudged against a soggy sky. Below it on the Western Valley line from Newport to Brynmawr, empty and full coal trains trundle past each other at Crumlin Low Level station. Heading the southbound train is one of the sturdy '5600' 0-6-2Ts introduced by the GWR in 1924 specifically for work in South Wales. Both freight trains are rooted in past practice made up of slow, lumbering, four-wheel mineral wagons, none of them fitted with continuous brakes. "Twenty thousand persons were present......and cannon placed on both sides of the valley from which volleys were fired with but slight intermission throughout the day, and caused the mountains to reverberate with their thunder" gasped one eye witness to the opening ceremony for Crumlin Viaduct on 1 July 1857. The viaduct's designer, T W Kennard, who won the contract in open competition, later entertained 200 guests to an elegant dejeuner in his nearby residence, Crumlin Hall. 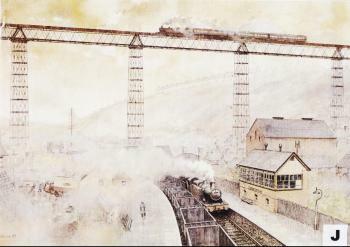 The viaduct was a triumph of iron which cost £62,000 and stood for 109 years. The cast iron piers which supported the viaduct were made in Kennard's own works at Falkirk in Scotland. The wrought iron girders which carried the rails were fabricated at the Crumlin Valley Ironworks specially constructed near the site, and which later made girder bridges for Italy, Spain, Portugal and India. Steam-operated to the end, the Vale of Neath line closed to passengers in 1964 when the section over Crumlin Viaduct was abandoned completely. A year later the disused viaduct featured grotesquely in the film 'Arabesque', when Sophia Loren and Gregory Peck rode horses onto the decking while villain Alan Bade fired at them from a helicopter which flew between the piers. By April 1966 the viaduct had been torn down robbing the valley of its delicate beauty. But it left behind a little mystery. When the first pier was laid on 8 December 1853 by Lady Isabella Fitzmaurice, a casket of coins bearing the current date was buried under it at the stone laying ceremony. Over a century later when 'Lady Isabella pier' was demolished no trace of the treasure could be found.